Home health BEWARE: Most Sachet & Table Water are Not Safe For Drinking!! BEWARE: Most Sachet & Table Water are Not Safe For Drinking!! It is the standard that sachet water should have a shelf life of two months and bottled water, one year. If water were properly produced, the shelf life would be well maintained. NAFDAC looks for the pH (this cannot be seen with the physical eyes, but measured with an instrument. A lot of the producers do not even know this. Microbiological analysis, by which bacterial colony development is checked, is another parameter. NAFDAC allows for a microbiological standard of about 100 bacterial colonies per field. It might interest you to know that from the analysis done by the public analysts, we (in this plant) allow seven bacterial count per field, which is because I enforce quality as a professional in water technology. At the risk of appearing to sound off, there are very top brands of bottled water, which the microbiological quality, though still within quality limit, is as high as 50 (brand name withheld). 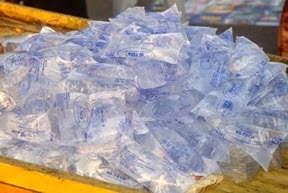 Water producers are supposed to go for re-certification by NAFDAC after two years for sachet water. For bottled water, it is done after five years. Unfortunately, immediately after the first certification at take off, they just produce without control. It is expected that the water be moved from the borehole as raw water, then through a number of filtration and treatment with chlorine and passed through Activated carbon before storage in the treated water tank. Treatment of water with chlorine is determined by the result of analysis of the raw water. Sampling of raw water, under microbiological analysis would likely show ‘uncountable’ in the bacteria count, chlorination is then carried out in order to reduce the bacterial load of the water. There are other ways of sampling the borehole water to ensure that the storage tank does not cause bacterial contamination. This is standard process that any water producer must follow, unfortunately there are so many quacks and compromised processes that even NAFDAC has failed to monitor. Water for production of sachet brand is drawn from the treated water tank and passed through set of industrial filters – carbon filter, micro filters and UV steriliser of a recommended length. (Carbon filter removes odour and colour, while the microfilters remove residual particles and dead bacteria). Even the raw water directly from the borehole must be passed through sand and carbon filters as initial treatment. NAFDAC expects any water producer to have a manager, who has a B.Sc or HND in the sciences, food technology, and microbiology to monitor these things. There are about 300 or more water producers in Alagbado zone, so water production chemists and other professionals should be needed as well as other supporting staff. The sector should generate a lot of employment either on full or part-time, if monitoring and enforcement are done properly. There is the Association of Table Water Producers, an umbrella body for all producers in the country that is supposed to have a measure of control on members. Even at the association level, tackling quacks has been a challenge. Some people are just dispensing raw water in sachets and bottles from their apartments of single or two rooms. Some are known to set up anything during the dry season, when it is perceived there would be higher sales and disappear during the rainy season. For them, it is a seasonal thing, they are not commited to the business and such ones cannot call for NAFDAC inspection. This kind of water has some unpleasant taste, but the consumer must have swallowed part of it before realizing what is up. Infection can ensue even with only a little quantity drank of a bad product. Incidentally, the producers of this kind of water have wide distribution network and well-branded packages.